The Mexican carrier transforms Sukhoi into the first Russian passenger plane manufacturer in the North American market. Early on the crisp morning of Sept. 18, 2013, Russian aviation crossed a modern milestone: The first two Sukhoi Superjets (the only civilian plane developed since the fall of the Soviet Union) completed their debut flights between Mexico’s capital and the central Mexico cities of Torreon and Aguascalientes. Mexico’s second-largest carrier, Interjet, became the first North American airline in history to operate a Russian passenger plane. Soon, the planes are scheduled to fly to other Latin American countries, as well as to the United States. Interjet, which controls 25 percent of the domestic market and 15 percent of international traffic among Mexican airlines, hopes the 20 Superjets set to be delivered over the next two years (with an option for 10 more) will bring another 3 million passengers to the airline annually. 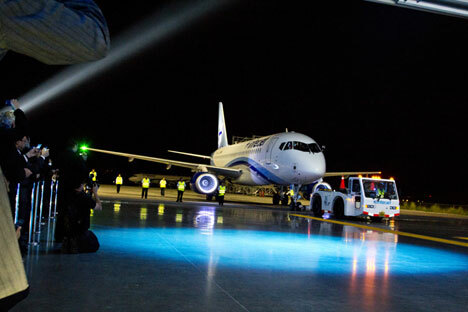 “The Sukhoi Superjet’s performance will be watched very closely by manufacturers, specialists and the entire aviation industry, because it is the first Russian plane to receive an EASA safety certificate and come to the North American market, which is dominated by other manufacturers,” Jose Luis Garza, managing director of Interjet, told RBTH. Sukhoi’s dreams of entering the North American market are beginning to be realized thanks to one man: Miguel Aleman. The 46-year-old Interjet CEO became the first international entrepreneur to believe in Sukhoi’s foray into civilian aircraft. Aleman stunned the global aviation community by choosing its still-to-be-built Superjet over the well-established rivals, Bombardier and Embraer, at the start of 2011. Sukhoi has been known for decades as a maker of top-notch military aircraft exported worldwide, but the Superjet was its first attempt to make a civilian aircraft capable of competing with the world’s best. A tragic crash in Indonesia during a demonstration to potential clients in early 2012 killed all 46 people onboard and was later blamed on pilot error — making the world’s carriers all the more skeptical of the newcomer. By choosing to commit to 20 Superjets on top of Interjet’s existing fleet of less than 40 Airbus 320s, Aleman had effectively tied the fate of one of Mexico’s largest carriers to the success of the Superjet project. “My father had the honor to meet Yuri Gagarin [the first human in space] after his historic flight, and they stayed friends after that,” Aleman told Russian business daily RBC. Aleman is known for leading Mexico’s successful entry into low-cost aviation. “When we founded Interjet in 2005, it was cheaper to fly from Mexico City to Paris than to many domestic destinations. Then there were two companies on the market: Aeromexico and Mexicana, both owned by the state. We came to them with the idea of allowing private companies on the market. Now there are 17, each with its own advantages,” the Interjet CEO said. Interjet has grown from an original fleet of seven planes to 41 today, operating to 33 destinations, including Miami, New York and San Antonio. “The international aviation market has been dominated by four manufacturers for decades: Airbus, Boeing, Embraer and Bombardier. Now Sukhoi Civil Aircraft are offering competition. This [deal] could lower ticket prices throughout the entire [Latin American] region. It will be our contribution to the economy and will help ordinary people as prices go down,” said Aleman. The first Sukhoi Superjet was transferred to Interjet at Paris’ Le Bourget Air Show in June of this year, after which the plane underwent the mandatory flight testing before commercial exploitation began. All eyes were on the Mexican carrier after Sukhoi’s first commercial partners — the Armenian national airline, Armavia, and Russia’s leading carrier, Aeroflot — both ended up returning planes due to high maintenance costs. In March 2012, all seven Superjet planes in global operation were grounded to have defective landing gear repaired. While final assembly of the Superjet is made in Russia, many of its parts come from all over the world. Boeing has been Sukhoi’s chief consultant on the project, while Italy’s Alenia owns 51 percent of the joint venture. Enough of the plane’s components come from Europe that its purchasers (including Interjet) qualify for loans from European Union export banks. American companies produce the electrical system, running gear, wheels and brakes. In addition to Interjet’s two planes, today there are over 30 Superjets in operation worldwide by Russian carriers Aeroflot, Yakutia, Gazpromavia and Moskovia, Indonesia’s Sky Aviation and Laos’ Lao Central Airlines. Over 200 more have been ordered by other carriers in Italy, Switzerland, Russia, the U.S. and other countries. The project also provides the backbone of an aviation revival that has seen production of civilian aircraft increase from a low of five in 1996 to a projected 40 this year (helicopter construction has bounced back from 26 in 1998 to 330 in 2013). “At the end of next year, we’ll launch [Superjet] flights from the Yucatan peninsula to Miami and to other international destination in Central America,” said Aleman. American air passengers may be the next to benefit from this alliance between Sukhoi and Interjet, which is making cheap flying an increasingly convenient option.